As the largest mucosal surface in the human body, the gastrointestinal mucosal layer can be found in the stomach, small intestine, and colon with specialized properties and composition in each. Along with being home to microflora, the mucosal layer is also the site of digestive enzyme secretion and the primary site of nutrient absorption. As the body’s first line of defense against foreign antigens, it is heavily populated with various lymphocytes, antimicrobial peptides, macrophages and natural killer (NK) cells, and serves as the origin for secretory immunoglobulin A (sIgA) production. Foreign antigens that reach the gastrointestinal tract are initially confronted by macrophages within the mucosal barrier. These macrophages, usually dendritic cells (DCs), present the antigens to CD4+ T helper lymphocytes which then differentiate into T helper cell subsets, including Th1, Th2, and Th17.2 This process known as transcription, is driven by genetic susceptibility, the type of antigen presented, and types of cytokines produced by the encounter.2 What follows is a discussion of the immune response within the mucosal layer and its influence on T-cell differentiation. Differentiation toward a Th2 response is triggered mainly by IL-4, a cytokine also associated with IgE. Th2 cells also secrete IL-4 and other cytokines including IL-10, IL-5, IL-6, IL-9, and IL-13 which are responsible for eosinophil, B cell, and mast cell activation.3 These cytokines also induce peristalsis in the gut and increase mucus secretion. 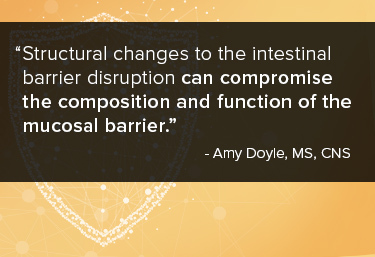 It is important to recognize the interaction between the gut microflora, immune system, and the epithelial lining, and the influence of these factors on the mucosal barrier.5 Structural changes to the intestinal barrier like microbiome, epithelial, or tight junction disruption can compromise the composition and function of the mucosal barrier.5 This can lead to a risk of increased permeability and an accompanying risk of gastrointestinal and extra-intestinal sequelae. Atrophy of the mucosal barrier can result in translocation of bacteria and other macromolecules from the environment across the epithelial barrier and provoke aberrant T cell differentiation and immune response.2 These interactions along with assessing the patient’s stress, diet, and age-related digestive changes may indicate a need for targeted support for proper gastrointestinal function and defense. Vighi G, Marcucci F, Sensi L, et al. Allergy and the gastrointestinal system. Clin Exp Immunol. 2008. 152 (Suppl. 1):3-6. Fasano A, Shea-Donohue T. Mechanisms of Disease: the role of intestinal barrier function in the pathogenesis of gastrointestinal autoimmune diseases. Nat Clin Pract Gastroenterol Hepatol.. September 2005. 2(9):416-22. Sult T. Th1/Th2 Balance: A Natural Therapeutic Approach to Th2 Polarization in ... ANSR. 2003. Omenetti S, Pizarro S. The Treg/Th17 Axis: A Dynamic Balance Regulated by the Gut Microbiome. Front Immunol. December 2015. 6:639. De Santis S, Cavalcanti E, Mastronardi M, et al. Nutritional Keys for Intestinal Barrier Modulation. Front Immunol. December 2016. 6:612.